Does watching Han Solo or C-3PO similarly influence our language processing? Several studies have demonstrated that perceiving an action influences the subsequent processing of action verbs. However, which characteristics of the perceived action are truly determinant to enable this influence is still unknown. The current study investigated the role of the agent executing an action in this action–language relationship. Participants performed a semantic decision task after seeing a video of a human or a robot performing an action. 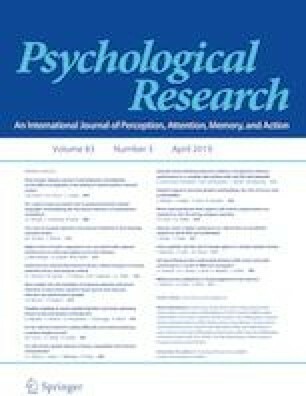 The results of the first study showed that perceiving a human being executing an action as well as perceiving a robot facilitate subsequent language processing, suggesting that the humanness (The term “humanness” is used as meaning “belonging to human race” and not to refer to a personal quality) of the agent is not crucial in the link between action and language. However, this experiment was conducted with Japanese people who are very familiar with robots; thus, an alternative explanation could be that it is the unfamiliarity with the agent that could perturb the action–language relationship. To assess this hypothesis, we carried out two additional experiments with French participants. The results of the second study showed that, unlike the observation of a human agent, the observation of a robot did not influence language processing. Finally, the results of the third study showed that, after a familiarization phase, French participants too were influenced by the observation of a robot. Overall, the outcomes of these studies indicate that, more than the humanness of the agent, it is the familiarity which we have with this agent that is crucial in the action–language relationship. This work was supported by the Japan Society for the Promotion of Science. Experiment 1 was conducted during an in-doc by Sophie-Anne Beauprez at the University of Tokyo. We would like to thank Yoshida Fumiaki and Masaoka Shiori for their help in the experiment development, the recruitment of the participants, and data collection. The experiments were conducted in accordance with the ethical standards of the institutional and with the 1964 Helsinki declaration.